122 scientific research projects were awarded at the closing ceremony of the Southern National Science-Technology Contest for students held at Ton Duc Thang University on March 19. The contest received 229 entries of 409 students of 34 schools. This competition aimed to arouse student’s passion of doing scientific research, said Deputy Education Minister Nguyen Huu Do at the ceremony. Thereby, the teachers were encouraged to innovate their teaching method by accessing to students’ ability and narrowing the education gap between high school and universities. Thirteen students were awarded the first prizes, 25 were given second prizes, 35 were granted third prizes and 49 others received fourth prizes. Winners will be selected for Intel ISEF 2019 in the United State. 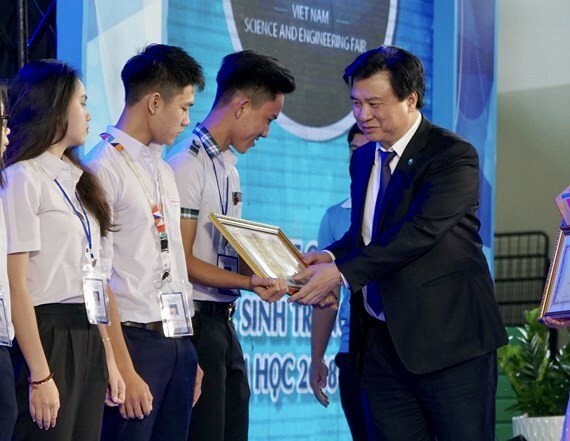 Students Le Nguyen Anh Khoi and Nguyen Viet Duc of Tan Phu High School in Ho Chi Minh City grabbed the first prizes for their research named “ Designing some equipment to support students with weak vision while carrying out physic lab work. The contest took place from March 16 to March 19.